Season chops well with salt and pepper. Heat olive oil and butter in large cast iron or heavy skillet over medium heat. Place chops in skillet and sear 3-4 minutes per side. Add mushrooms, fresh herbs and garlic to skillet. Spoon melted butter and olive oil over the mushrooms and chops and place pan in preheated oven. Cook chops to a minimum internal temperature of 145 degrees or until desired doneness, about 10-12 minutes for medium rare. 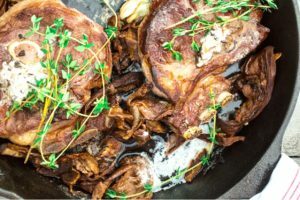 Remove from the oven and transfer the chops and mushrooms to a serving platter. Tent with foil and let rest 5 minutes before serving. Slice a few pieces of the compound butter and place on top of the chops right before serving. Enjoy! In large glass bowl or glass measuring cup cover porcini mushrooms in boiling water. Soak mushrooms 10-15 minutes. Drain (reserve water for other use) and dry well with paper towel. Roughly chop mushrooms and place in bowl of electric mixer. Add remaining ingredients to the mixing bowl and blend until smooth. Spoon mixture onto a sheet of plastic wrap. Roll into a log and wrap tightly. Twist ends to seal. Refrigerate until firm.